Love, Mrs. Mommy: Spectra S1 Breast Pump Giveaway! Spectra S1 Breast Pump Giveaway! Here's a wonderful giveaway for the breastfeeding mamas out there! Good luck! Did you know that many insurance companies will now cover a brand new breast pump for expecting and new parents? That's right! There's no need to spend hundreds of dollars out-of-pocket for a new pump. A new, name-brand breast pump can be yours and there are services out there that will do all the work for you - including billing insurance and shipping the pump to you for free. Edwards Health Care Services is one of these organizations and they believe that all women should have access to breastfeeding equipment. So, they make the process of obtaining a breast pump simple. All you have to do is fill out their online form or give them a call. One of their Breast Pump Concierges will take care of verifying your insurance, getting a prescription from your doctor and communicating with your insurance company on your behalf. Once they verify the order with you, they'll ship the breast pump for free right to your door. Easy, right?! 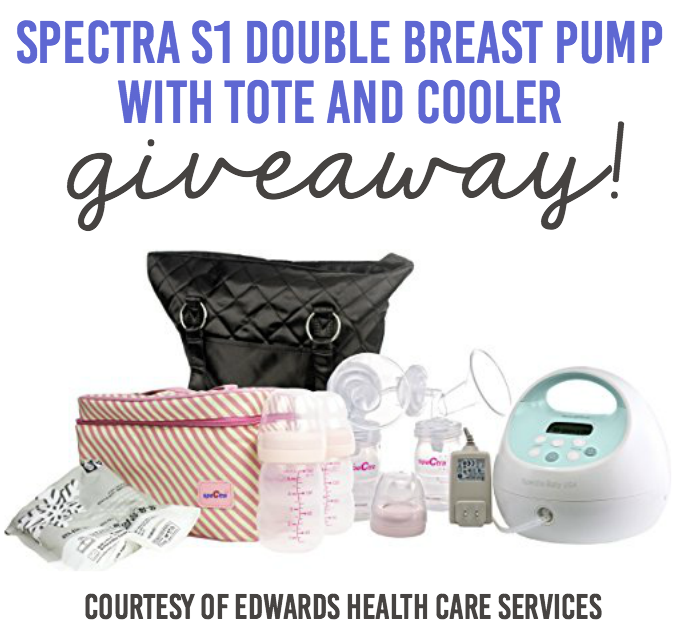 Edwards Health Care Services is offering one lucky reader a Spectra S1 Double Breast Pump with tote and cooler! The S1 with tote and cooler is a “deluxe” pump and would incur an upgrade fee when ordered through insurance, but they want to ensure you have everything you need to get started on the right foot. You can learn more about Spectra pumps by following their Facebook page. The S1 Hospital Grade Double Electric Breast Pump with inbuilt rechargeable battery is available. Providing all the features of the S2, with the addition of an inbuilt rechargeable battery. This means that you are now able to benefit from the efficiency, power and performance of a hospital grade breast pump, without compromising on portability. Open to the US only, ages 18 and up. Ends at 10/20/16 at 11:59 PM EST. Disclosure: One winner will be randomly selected using the Giveaway Tools random selector and notified via email. Once notified, the winner will have 48 hours to respond or a new winner will be chosen. This giveaway is in no way associated with Facebook, Twitter, Instagram, Pinterest or Google. Void where prohibited.